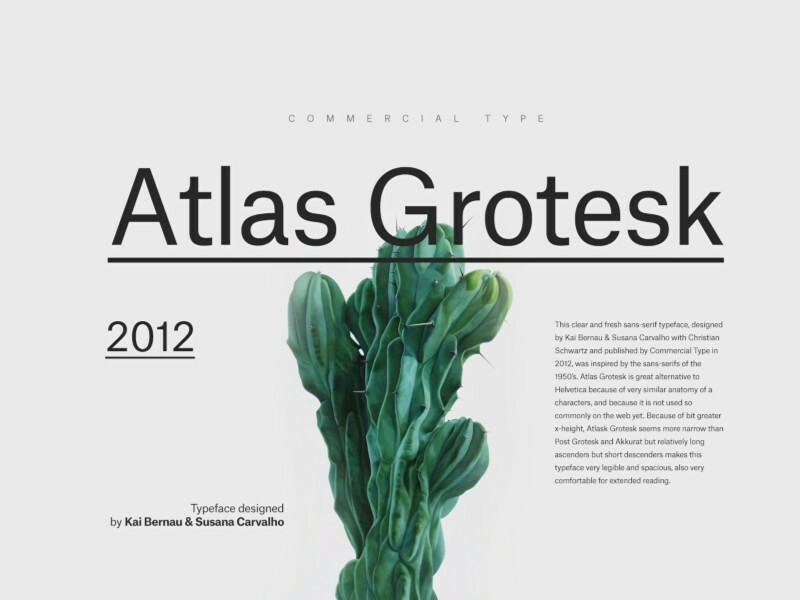 Post Grotesk is designed by Josh Finklea in 2011. It is contemporary version of the traditional grotesque sans-serif with very sophisticated and beautiful linear forms with low contrast and generous x-height. Very relaxed fit gives this font elegance in display sizes and it also works very good in a body text. 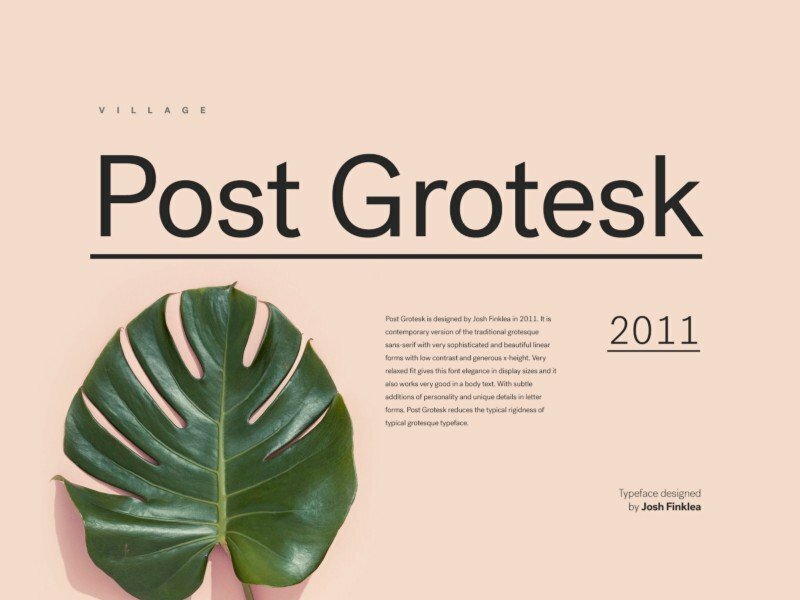 With subtle additions of personality and unique details in letter forms, Post Grotesk reduces the typical rigidness of typical grotesque typeface. Available in 4 weights in roman and italic — light, book, medium and bold, with built-in small caps. Post Grotesk offers extensive language support and lots of useful additional characters/glyphs so it can be widely used on different language websites. 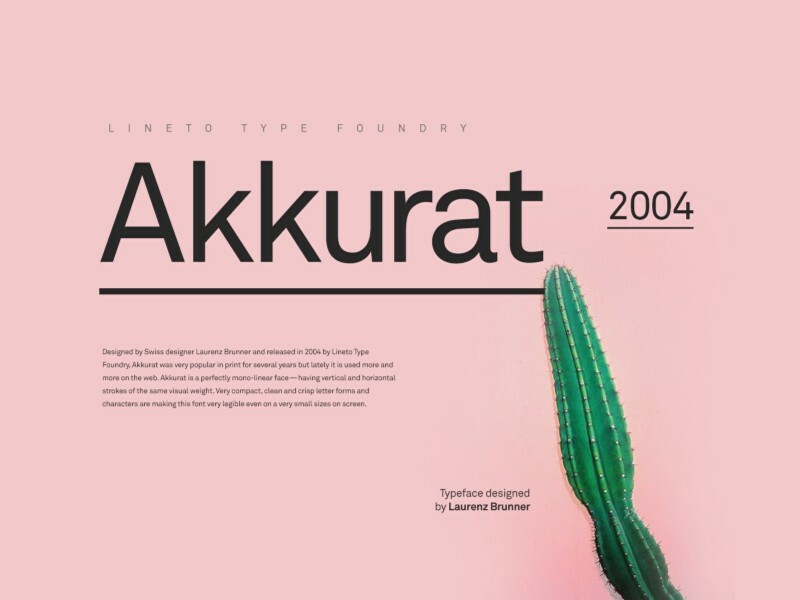 Designed by Swiss designer Laurenz Brunner and released in 2004 by Lineto Type Foundry, Akkurat was very popular in print for several years but lately it is used more and more on the web. Akkurat is a perfectly mono-linear face — having vertical and horizontal strokes of the same visual weight. Very compact, clean and crisp letter forms and characters are making this font very legible even on a very small sizes on screen. Akkurat is available in 3 weights — light, regular and bold, each with matching italics. This clear and fresh sans-serif typeface, designed by Kai Bernau & Susana Carvalho with Christian Schwartz and published by Commercial Type in 2012, was inspired by the sans-serifs of the 1950’s. Atlas Grotesk is great alternative to Helvetica because of very similar anatomy of a characters, and because it is not used so commonly on the web yet. Because of bit greater x-height, Atlask Grotesk seems more narrow than Post Grotesk and Akkurat but relatively long ascenders but short descenders makes this typeface very legible and spacious, also very comfortable for extended reading. It has well considered range of weights — 6 weights from thin to black, all with italics. Suisse is a collection of three OpenType families: Suisse Works, Suisse International and Suisse Neue published by Swiss Typefaces in 2011. Suise Int’l is a neo-grotesque sans-serif typeface designed by Ian Party. 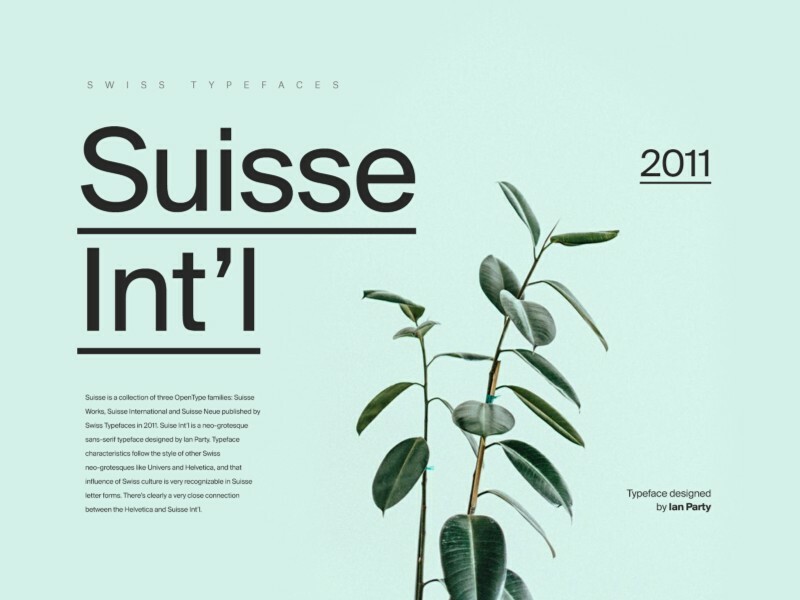 Typeface characteristics follow the style of other Swiss neo-grotesques like Univers and Helvetica, and that influence of Swiss culture is very recognizable in Suisse letter forms. There’s clearly a very close connection between the Helvetica and Suisse Int’l. 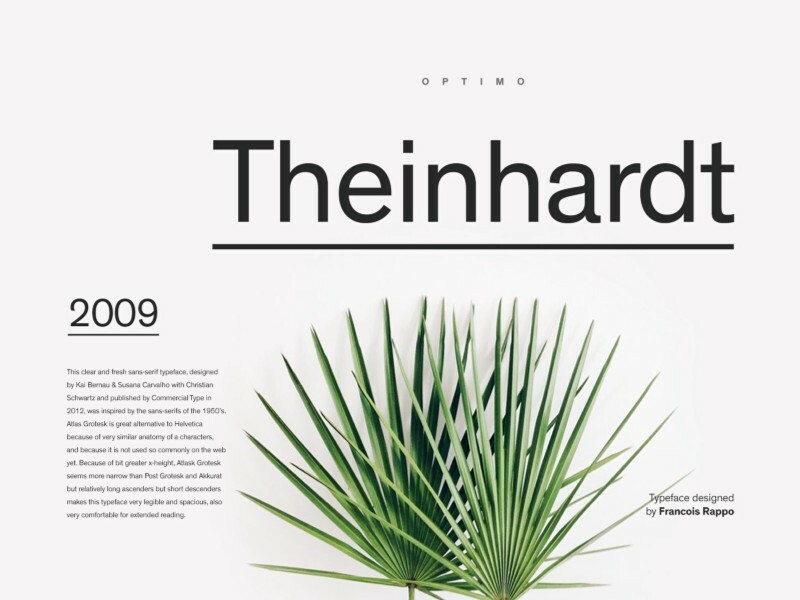 Theinhardt is typeface based on grotesk, a classic serif font but it’s an updated contemporary and very flexible new take on the classic with very modern look. It was designed by Francois Rappo, published in 2009 by Swiss Foundry Optimo. It was named after German type designer Ferdinand Theinhardt. It strongly resembles the Akzidenz Grotesk, and it is hugely versatile on the web today. Because it has such a broad family, it is good solution for body text as it is for headlines and navigation elements. Available in 9 weights with italics. Aktiv Grotesk is designed by Ron Carpenter & Fabio Haag and published by Dalton Maag in 2010. It is designed somewhere between Helvetica and Univers, and itself was designed to provide a modern alternative to Helvetica — a fractionally taller x-height than Helvetica, and slightly squarer edges compared with Univers. It is designed to stay true to the grotesque tradition, but also has a degree of neutrality. Aktiv Grotesk supports 221 different languages such as Arabic, Spanish,English, Portuguese, Russian, German,French, Pashtu, Greek Polytonic,Greek and Hebrew in Cyrillic, Latin, Arabic, Greek, Hebrew, and Other scripts.